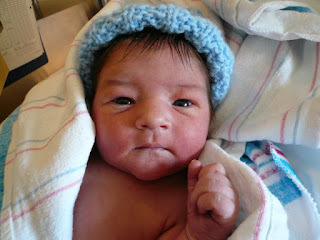 Theodore was born at 4:38 AM on September 20 at the North Shore Birth Center on the campus of the Beverly Hospital. Rebecca used natural childbirth methods and delivered without drugs. The previous day, she was given some prostoglandin gel to 'encourage' labor, due to some concerns about low levels of fluid in the placenta which were resulting in brief drops in the baby's heart rate. Her true labor began around 6:30 PM on the 19th. Rebecca labored attended by her husband, Tyler (me), two midwives from the Birth Center, Eva Wax and Debbie Black, and Rebecca's doula, Amy Kreydin. Rebecca spent several hours laboring quietly in the tub. She used the Hypnobirthing method we had studied together, which relies on deep relaxation, long, slow breathing during contractions, and prompts from the father to assist in the relaxation process and release tension. This method worked very well for Rebecca, who was truly happy with her birthing experience. After it was time to start pushing, Rebecca left the tub at Eva's suggestion, so that gravity would assist the birthing process. The midwives checked the baby's heart rate throughout labor and commented on how consistently good and strong his heartbeat was. After pushing for just over two hours, she gave birth to Theo on a birthing stool. Theodore did not immediately breathe on his own at birth. He had good color, though, and a good heartbeat. After some suction and resuscitation, a 'code pink' was called to rush him to the emergency room. Theo's color improved even more by the time the crews from across the street arrived, and he started to move on his own while leaving the Birth Center. Amy and Eva stayed with Rebecca while Tyler rushed to the ER with Theo and the emergency team. Theo started with a few tiny cries in the parking lot, and by the time he was in the ER, he was pink and crying like a normal, healthy baby. All of the initial tests came back normal, so he was sent to the regular nursery, and not the ICU. We stayed at Beverly Hospital for 48 hours after Theo was born. We had thought about leaving after 24 hours, but the pediatrician on duty recommended staying the full allowed time so that while we were sleeping, the nurses could keep an eye on Theo's breathing. So he roomed in with us while we were awake and was monitored by the staff as we slept. The nurses brought Theo to Rebecca regularly overnight to be nursed, and mom and baby got off to a great start. While we were in the hospital, everyone who came to see us--nurses, the on-call pediatrician, the lactation consultants--commented that Theo was a particularly beautiful baby. We thought he was quite gorgeous, of course, but as parents, we know we are biased. So it was fun to have our opinion backed so strongly by people who work with babies on a full-time basis! On the morning of September 20th at 4:38 AM, Rebecca gave birth to our first child, Theodore Edward Consentino Hains. He weighed 7 lbs 11 oz, and was 20 inches long, with a full head of dark hair. Theo was one week overdue, but Rebecca had a healthy pregnancy and felt generally comfortable to the end. 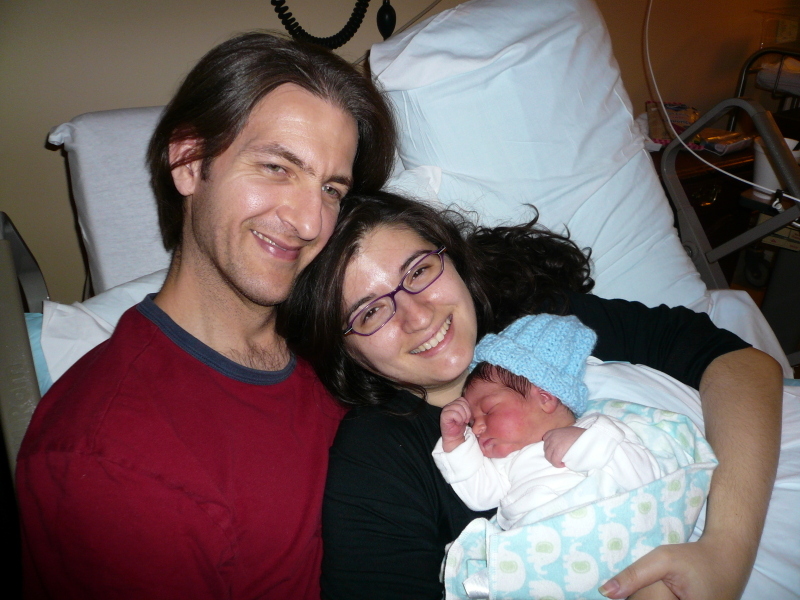 For childbirth, Rebecca used natural methods and did extremely well. Theo has been nursing and sleeping, with nice periods of alert wakefulness. All seems to be going well. We were discharged from the hospital today and are now happy to be home. Thanks to everyone for all your good wishes!